What a wonderful collection of photos and memories! The colorful ferris wheel is especially striking. That looks like a wonderful trip! Terrific pictures. Wow! That must have been quite an experience. Just beautiful. I love all the colors present throughout all your pictures. And, loved the fireworks. Wow, so impressive! My eldest son lived in London for a few months in the 1990s, and developed his lasting love for Indian food while he was there. What a fabulous way to bring in the New Year! I love the Big Ben shot and the crowd shot. That entire trip looks fabulous! The fireworks would be so much fun to see! Looks like lightning flashing from inside Big Ben in places. Is it European custom to have fireworks at New Year's? Fellow writer in Denmark mentioned it in his blog. We have fireworks on Canada Day. Wow! I love all of those colours in the market and the ferris wheel. Great job of capturing it all. Fantastic photos! Love all the colors. I so want to visit London some day :) Beautiful! What a lovely trip you had. 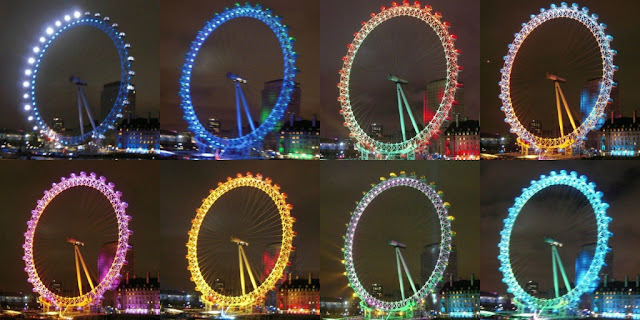 I love the photos of the London Eye in colours. I've never been to London (it's a long way from Australia)- but it's one of my things to do in the next few years. Nice photos Jyoti.. hope you had a blast in London.. Bikanerwala.. ooh mouth watering.. reminds me of Delhi.. I had been to London last year and enjoyed the visit. Your beautiful pictures brought back the sweet memories. Thank you Jyoti! The London eye looks so beautiful and colourful!